When I was young only the poor lived on the water, mostly the people who made their living from the sea. Travelling in Asia one can still see evidence of housing that reminds me of the Pacific coast of Canada back in the 50s. 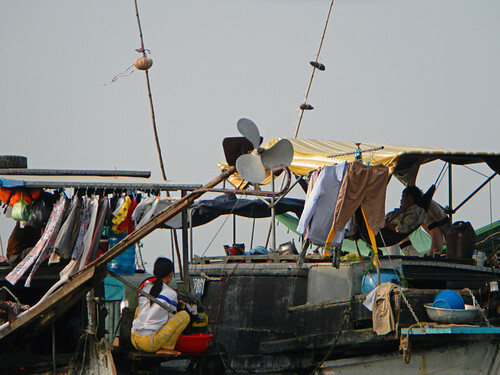 The ferry on the Chao Praya chugs past makeshift houses lining Bangkok’s klongs (canals). 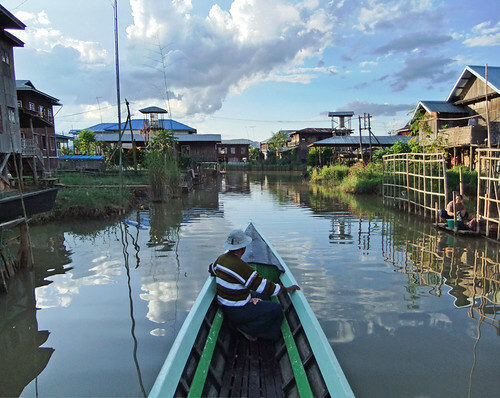 Inle Lake in Myanmar was another interesting study of housing on or near the water. 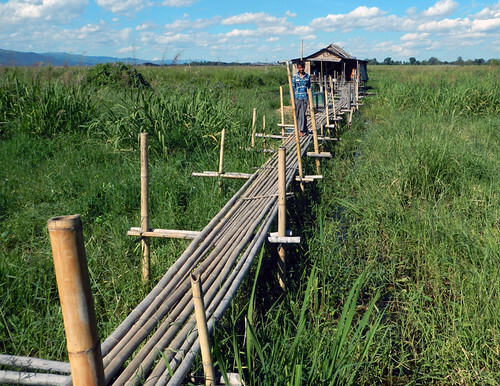 In Myanmar, many people had floating gardens to supplement their regular diet of fish. Tan Jetty, a World Heritage Site in Penang, Malaysia. The biggest problem with this sort of housing is that the toilets often open directly onto the sea. Connected to the land by boardwalks and being a World Heritage Site, Tan Jetty now has access to funding to improve the plumbing situation. This fisherman’s shack on the beach in Pangkor, Malaysia would never be considered ‘World Heritage’ and will probably be removed in the future. This is a photo from 2003 of a floating fisherman’s village in Halong Bay, Vietnam. It was quietly removed and a couple of years later we saw ads for expensive condos overlooking on the waters of this bucolic island of Cat Ba. 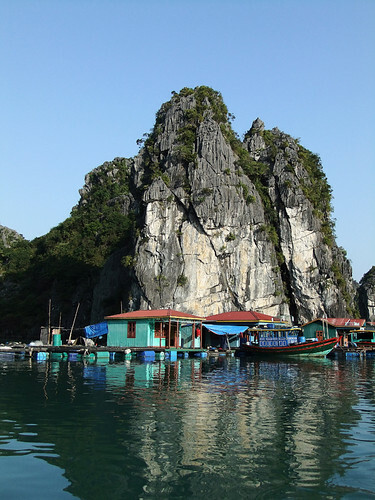 In 2013 we visited one of the last fishing villages left in Halong Bay. The bay itself is a World Heritage Site; the fishing villages not so much, and will be removed due to concerns about sewage and pollution. In the south of Vietnam thousands of people still live on boats on the Mekong River, and there is a whole lifestyle based on river life. 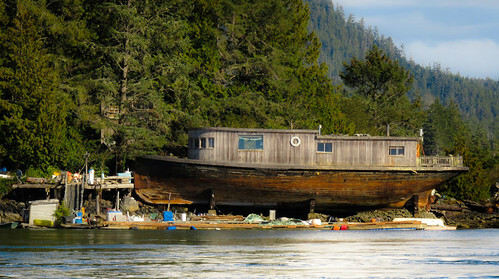 On the west coast islands of Canada squatters either built houses of found wood or docked houseboats on public lands edging the ocean. In the 70s most were evicted and the land sold to the wealthy who wanted water views. 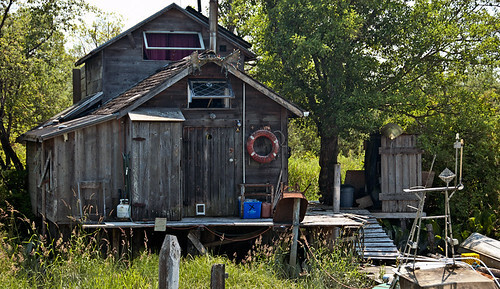 One of the last hold-outs around Vancouver is Finn Slough in Steveston. Originally inhabited by fishermen of Finnish origin, their wooden houses and walkways were built on a sheltered slough. Their fishing boats were anchored nearby, the slough leading out into the ocean where they made their living. More on Cee’s Fun Foto Challenge: Words with the Letters O + U. Waterfront housing in Asia certainly differs to that in Noosa. The picture of the toilet is probably a scene that won’t be seen for much longer. There’s not much in Canada that is really comparable either – but back in the 50s I remember a wooden outhouse hanging over the edge of a rock. They will be soon gone everywhere – the world has too many people now to allow it to continue. On the other hand, plastic wasn’t a big problem back then! 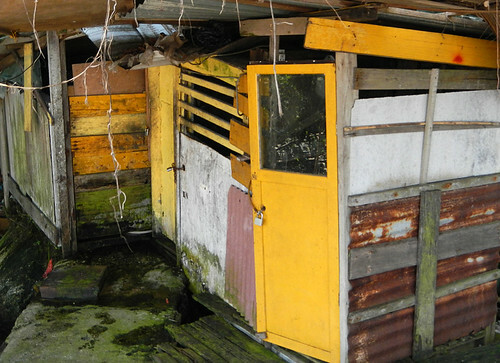 You’ve reminded me of some of the houses I saw while working in Papua New Guinea of a similar ‘stilt’ design without plumbing. Great images. 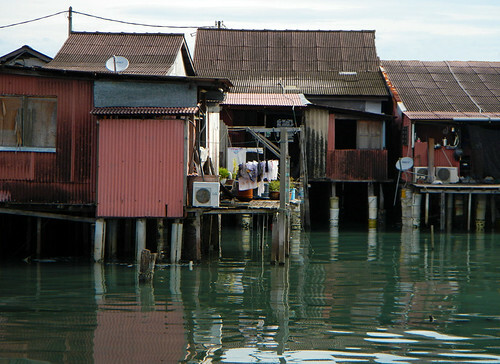 The stilt housing is extremely practical for storms and flooding. In many places I saw that people kept their chickens under the houses and presumably brought them upstairs if they were in any danger! These places are so similar to BC’s west coast when I was a child – I feel such nostalgia but realize that it was less idyllic for my parents, especially for my mom with two babies and no running water. There was an outbreak of yellow jaundice from dirty water – we didn’t get it as my mom boiled all the water but many of our neighbours ended up in the hospital. I always enjoy it when you come up with topics from around the world. Excellent post. I started with housing in general and then I had way too many images so I eventually whittled the topic down to waterfront properties for the poor. It’s really interesting for me to do these posts too! I was intrigued by the floating gardens – a clever idea! Mexico City also had floating gardens during Aztec times in Xochimilco. Thanks for that. I must look that up, sounds interesting. Xochimilco is still there but now Mexican families go there on Sunday afternoon and float down the waterways on boats – when we were there we joined up with a mother and daughter who couldn’t afford a boat on their own – had a great time – there were boats full of Mariachis who would play requests and smaller boats selling snacks and food!